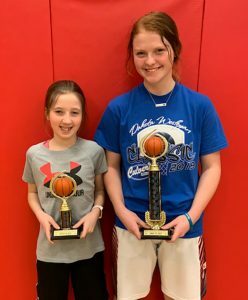 Addyson Baruth and Trista White participated in the State KC free throw contest Sunday in Chamberlain. Addyson placed fifth in the 11-year-old age division making 16 out of 25 shots. Trista placed second in the 14-year-old age division making 24 out of 25 and making two of five in the shoot off. On Saturday, March 30, the SCW fifth grade boys’ basketball team played in the Pacesetter South Dakota State B Tournament, and the young Blackhawks came home the champions. Members of the championship team are pictured, back row, left to right: Coach Jason White, Sam Baruth, McCoy Schulz, Tyler Baruth, Landon Jensen, Clay Moody, Parker Ettswold and Coach Andy Ettswold; front row: Teagen Moody, Tanner Christian, Oscar Anderson, Grant Edwards and Eli White. 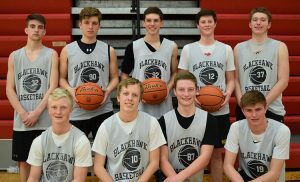 The SCW Varsity boys who took part in the Willie Mac Tournament in Brookings last weekend are pictured, back row, left to right: Malachi Bruce, Noah Dickson, Tater Moody, Cayden Slykhuis and Keistan Dubro; front row: Mason Moody, Tryce Slykhuis, Andrew Lindgren and Clay Olinger. On March 23, the Sanborn Central/Woonsocket boys’ basketball team participated in the Willie Mac Hoops Basketball Tournament held in Brookings. Read how it went in this week’s issue of the Sanborn Weekly Journal!